Our brains contain trillions of synapses, each of them capable of converting an electrical signal into a chemical one, and vice-versa. But while that might sound simple, the mechanics behind this process is anything but — as this spectacular new 3D visualization so beautifully illustrates. These visual representations of an average synapse are probably the most accurate and detailed yet. They were compiled by German scientists using an array of equipment and techniques, including Western blot, mass spectrometry, electron microscopy, and super-resolution fluorescence microscopy. Because of privacy settings we can't embed the video here, but you can watch it at Vimeo. The video shows the synaptic bouton...The glowing red "active zone" at the bottom is where the neurotransmitters get dumped into the cleft. Toward the end of the video you can see a close-up of a vesicle releasing its contents and then being recycled by the cell. 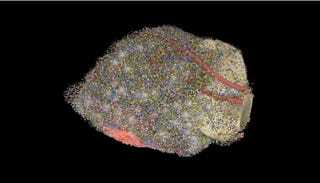 The model shows some 300,000 individual proteins, and remember — they're all hanging out at a single synapse! The image below shows a cross-section of the bouton; each color corresponds to a different kind of protein. The active zone is again the glowing red part at the bottom. Maps like these are helping scientists to focus on specific protein types that could trigger conditions or lead to treatments. Read Virginia Hughes's entire article here. And check out the entire study at Science: "Composition of isolated synaptic boutons reveals the amounts of vesicle trafficking proteins."